Realistic Billiard Table 100% Original Mesh perfect for your entertainment center, venues or for having fun. There are 4 wood options (Black, Classic Wood, Old Wood and White), and all of them comes in 2 versions: PG (with 89 animations) and Adult (153 animations). 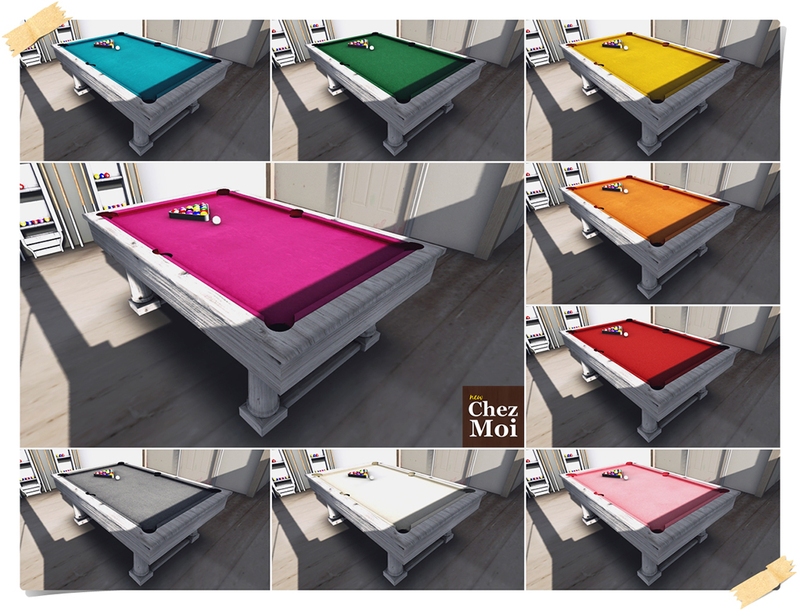 ♥ 35 single animations (female and male) including 2 poses for pool table. ♥ Realistic effects in different lights. IMPORTANT: This table is just for decoration purpose. You can’t play. Those sets are available on CHEZ MOI MARKETPLACE, or for a closer look, visit our INWORLD STORE.